I am working on colouring books for adults so I decided to use one of the sheets. The experience is fun, therapeutic, stress relieving and for that moment of time your mind is blank and only concentrating on the colouring sheet. Try it with whatever you have available and see the effects. Today I had the luxury of unboxing one of my products; a box of colour pencils made with maps. To be very honest, I felt nice and actually did not want to open the packaging, I wanted it to stay intact, frozen in time just the way it is. Does any one else feel the same way? 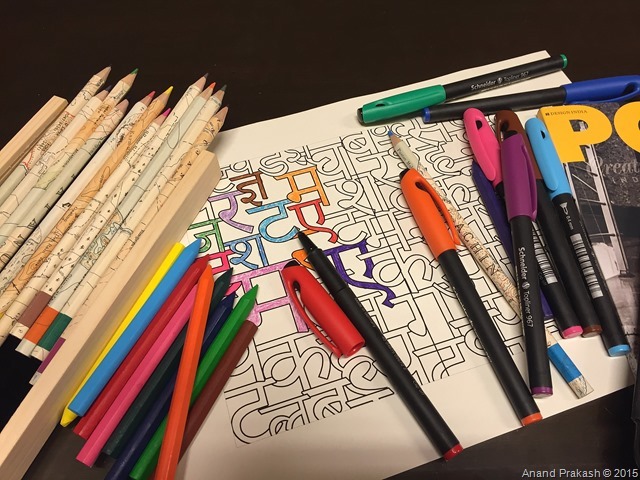 This entry was posted in Whats New and tagged Anand Prakash, Colouring book, colours. Bookmark the permalink.